The band presents its first concert Friday, December 8, at 2pm, in Baird Recital Hall (250 Baird). The event is free and open to the public. The Center congratulates them all for their stellar efforts bringing this unique project to life. The Band is a truly exceptional artistic endeavor, as opportunities for extended, in-depth composer-performer collaboration are rare, both in educational institutions and in the broader professional new music world. Very often in the new music world, intensive contact between composers and performers is possible only in final rehearsals, preventing meaningful long-term dialogue and relationship building. For young composers, this creates a difficult situation where the possibility of changing pieces in response to performer feedback is somewhat limited; in turn, seeking to avoid risk, composers in this predicament often end up neglecting musical possibilities that might lead, longer term, to the creation of new performance practices. This is why a project like the Band is so important, particularly for the young composers participating in the project, who have been given an ideal incubator to help them hatch musical ideas that might not be welcome in certain professional situations but that in the long run might lead to important compositional breakthroughs and influential new performance practices. The new music specialists who make up the Band have optimal skills and experience to assist the graduate composers in this endeavor. As an educational framework, the Band overcomes a common limitation of much composition pedagogy. Frequently composition teaching focuses primarily on the creation of a score; upon completion of a score, the musical work is seen as finished. However, in a performing art like music, the piece’s reality is in live performance, and the task of translating score into performance is a complex and challenging one, particularly in new music where one cannot meaningfully depend upon conventionalized interpretive rules, as is the case in standard repertoire classical music. In addition to mastering “compositional technique” in a more orthodox sense, successful composers must also learn rehearsal technique, and how to best communicate their ideas through notation and performance instructions. Creating meaningful performance practice for one’s compositions means creating a multi-tiered strategy distributed between these four aspects of a piece. Composition students at the Center are extremely fortunate to have numerous opportunities available to help them hone their ability to translate musical idea into performance reality. Between special projects like the Composers’ Workshop Band, guest performer residencies at the Center, and June in Buffalo, the Center’s graduate programs provide ideal circumstances for emerging composers to mature artistically. 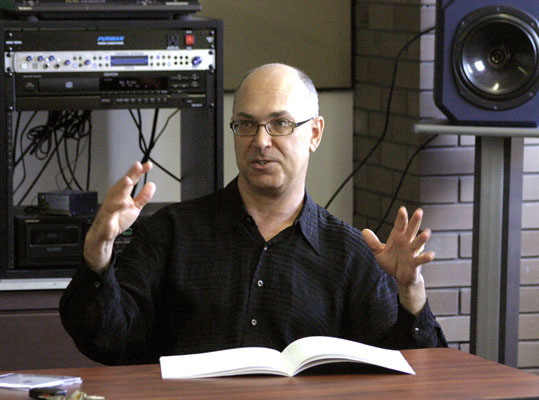 David Felder’s renowned pedagogy, with its astute emphasis upon students’ ability to mediate between conception and performance, is an enormous asset in this respect as well. It is thus no accident that numerous graduates of the Center have gone on to make music that asks ambitious questions about the nature of music’s performance, questioning conventions of performative possibility, instrumental and electronic technique, notation, and more.